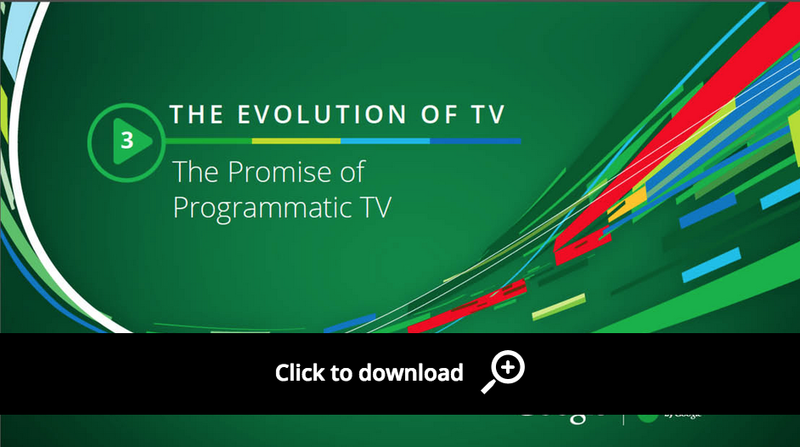 This post is part of DoubleClick's Evolution of TV series. In this series we identify the risks and opportunities around 7 dynamics transforming the advertising landscape as TV programming shifts to delivery over the Internet. Television advertising is big business. How big? TV ad spending in the U.S. is projected to reach almost $84 billion per year by 2018. Traditionally, many of these billions are spent during upfronts—that time of year when traditional TV networks and, increasingly, digital media companies gather to present their fall lineups and pitch marketers for ad dollars. Whatever TV inventory hasn't been sold, or is held back, is then sold in what is called the scatter market. While this traditional TV buying and selling model has worked well for decades, it's not without its inefficiencies. "Programmatic TV" is a likely solution that could apply digital advertising's efficiency models to improve TV advertising. In this new whitepaper we explore what exactly programmatic TV is and its promise for those involved. We define "programmatic TV" as a technology-automated and data-driven method of buying and delivering ads against TV content. This includes digital TV ads served across the web, mobile devices, and connected TVs, as well as linear TV ads served across set-top boxes. As with any new technology, though, the programmatic TV offerings on the market today fall short of the full potential of the technology. As a result, programmatic TV skeptics have reason to ask “why change what’s not broken?” We’re here to say that, while the TV buying and selling process isn’t exactly broken, there's a role for programmatic TV to make it better. In Part 3 in our Evolution of TV series (find the rest of the series here) we dispel the hype about programmatic TV, address the challenges, and concentrate on its promise for brand advertisers, programmers, and broadcasters. Download the new whitepaper from Think with Google for the in-depth story.